Company Drivers start at .50! Bay & Bay is bringing in the Near Year with a NEW PAY package in the Grand Ridge, IL area! Company Drivers start at .50! Bay & Bay is bringing in the Near Year with a NEW PAY package in the Grass Lake, MI area! Company Drivers start at .50! Bay & Bay is bringing in the Near Year with a NEW PAY package in the Newton, AL area! Company Drivers start at .50! Bay & Bay is bringing in the Near Year with a NEW PAY package in the Thomaston, GA area! Company Drivers start at .50! Bay & Bay is bringing in the Near Year with a NEW PAY package in the Kingston Springs, TN area! Company Drivers start at .50! Bay & Bay is bringing in the Near Year with a NEW PAY package in the Grosse Pointe, MI area! Company Drivers start at .50! Bay & Bay is bringing in the Near Year with a NEW PAY package in the Dimock, PA area! Company Drivers start at .50! Bay & Bay is bringing in the Near Year with a NEW PAY package in the Ulysses, KY area! Company Drivers start at .50! Bay & Bay is bringing in the Near Year with a NEW PAY package in the Union City, NJ area! Bay & Bay Transportation currently has over-the-road and local truck driving jobs available across the United States for experienced company and lease purchase drivers, as well as owner operators. 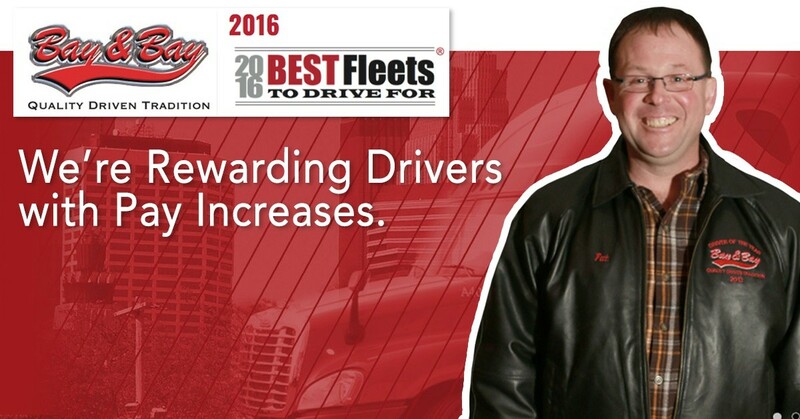 We offer driving professionals competitive pay and many other great advantages!